It’s the striking phenomenon marking the beginning of 2019. The Swiss peaks have literally been colonized by artistic activities. These may be commercial, aesthetic or intellectual in nature, but in any case they’re taking over the chicest locations. 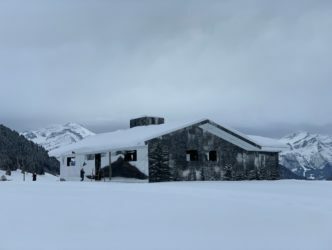 Clearly this phenomenon is nothing new because the Swiss dealer of Warhol and Basquiat, Bruno Bischofberger, already had a gallery at Saint Moritz and you can find the museum of the great post-impressionist artist Giovanni Segantini in this area, one of whose paintings has just been purchased by the Getty. But now there are all sorts of events going on in the mountains. The list is staggering (1). 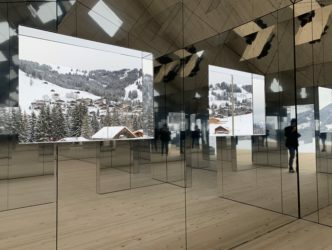 Among the most impressive of the ephemeral phenomena which have attracted contemporary art lovers from all over the world to the snowy Swiss summits, there was the third edition of Elevation 1049, which took place from 1 to 3 February at Gstaad. 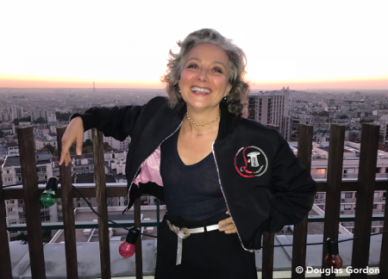 The operation is overseen by the Swiss mega-collector Maja Hoffmann with her Luma Foundation – best known, incidentally, for its project in Arles in the south of France in a building designed by Frank Gehry. 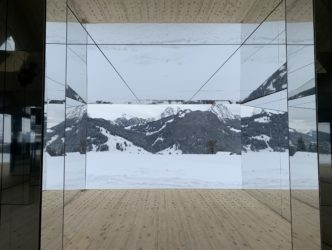 Together with the curators Neville Wakefield and Olympia Scarry, Hoffmann is behind this event, which since 2014 has assembled a range of performances every two years or so, dotted all over Gstaad (there are 9 contributors, from the French artist Dominique Gonzalez-Foerster to the American choreographer Isabel Lewis). 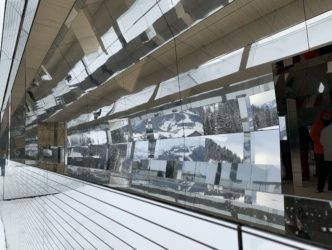 This year also sees the addition of a spectacular installation by Californian artist Doug Aitken. 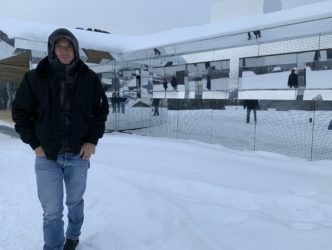 You have to really want to see it: on the outskirts of the town he has installed the aptly named “Mirage”, a house made of mirrors. The structure mimics the form of the surrounding chalets while its reflective cladding renders it completely invisible from afar. Up close, this hidden gem which can only be reached on foot resembles what we might call a panoramic kaleidoscope. Inside, the mirrors which reflect the landscape in black and white seem to create lines of convergence that blend in with the surrounding nature. The artist explains that he wanted to create an artwork which would change over time and with the climate. It is installed here for two years. He tells his story right in the middle of the snow. 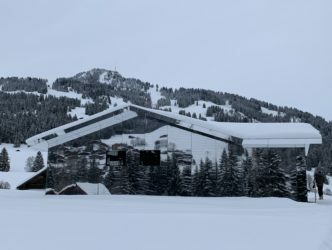 On the same weekend in this Alpine town, no doubt considered to be the wealthiest in the region – the chalets here sell for up to 100 million dollars – Gagosian decided to open a gallery right at the entrance to the little airport. 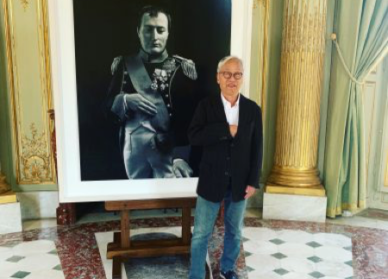 Getting out of your private jet, you can head straight to the space which is displaying images until 17 March by the superstarGerman photographer who’s been keeping rather quiet lately, Andreas Gursky. A specialist explains that the flurry of commercial activities is partly related, in his view, to the nature of the local residents, attracted by a particularly advantageous tax system, which is specific to each canton. There’s a good chance you could pay far fewer taxes in Gstaad or Verbier than in Geneva, for example. 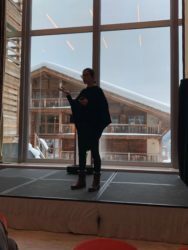 Nearly two hours’ drive away, travelling on icy winding roads to arrive at Verbier in the canton of Valais, a series of talks that has been held since 2017 took place this year on 1 and 2 February: the “Verbier Art Summit”. As its Dutch founder Anneliek Sijbrandij makes clear: “We want to create a Davos of the art world”. She also adds that the summit refuses any commercial intrusion on the part of dealers or auction houses. 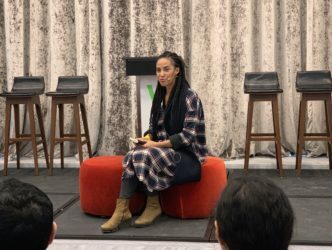 The contributors to its 2019 edition were particularly interesting, from Maria Balshaw, director of the Tate, to a whole series of scientists and artists preoccupied with changing societies, all led by Jochen Volz, director of the Pinacoteca in Sao Paulo. The general idea was to prove that art can change minds, and therefore society. Jochen Volz explains the idea behind the talks this year and addresses the issue of the contrast between the social motivation of these discussions and the location of this summit at a ski resort, which by its very nature embodies the wealth and privilege of this part of the world. There are many moving contributions, such as that of researcher Naine Terena who defends the indigenous people of Mato Grosso in Brazil. The translation is a little laborious, but her testimony is all the more meaningful at a time when the new president, Jair Bolsonaro, wants to evict the indigenous populations from certain lands to make more room for intensive farming. 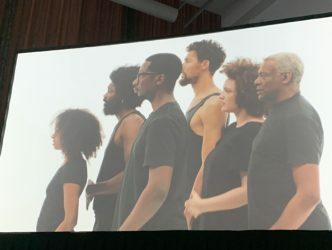 Tania Bruguera, the famous Cuban artist-activist and performer who has a difficult relationship with the authorities in her country, won over the audience with her freedom and her radical vision. The conclusion was presented by the artist of Thai origin Rikrit Tiravanija, who always finds a way to share everything, including his workload. In a very Duchampian spirit, he confessed to having prepared nothing and proposed that members of the audience each take it in turn to speak. 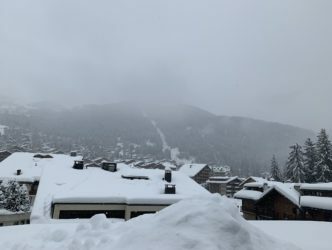 That afternoon at Verbier it was all about love, respect, generosity and open-mindedness, as if in the rest of the world, the nationalist and authoritarian tendencies, racism, and misfortunes of mankind, might at long last come to an end. Let’s meet again at Verbier next year, to dream once more. 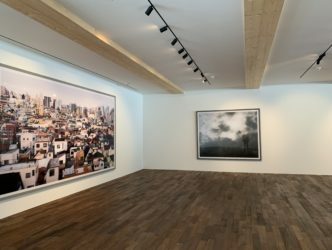 where Hauser & Wirth have just opened a gallery alongside those of Vito Schnabel, Andrea Caratsch and Karsten Greve. the former Swiss ambassador François Barras puts on now regular discussions under the title “Swiss Made Culture”. On 9 and 10 February he is handing over to the Swiss Institute of New York, directed by Simon Castets, who will talk about current artistic creation in the presence of the artist Valentin Carron, among others. The Tornabuoni gallery also has a site at Crans Montana. 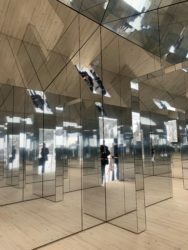 On 2 January in the canton of the Grisons, and more specifically in the village of Susch, the polish entrepreneur Grażyna Kulczyk opened a museum dedicated to contemporary art featuring a huge array of artists, from Marlene Dumas to César. There is a great appetite in the Alps for discussions on contemporary art, reflected in the Engadin Art Talks which took place on 26 and 27 January this year at Uster in the canton of Zurich, where you could attend talks by, among others, the German photographer and creator of powerful and unsettling images, Juergen Teller, the artist who makes art using spiders and the sun, Tomas Saraceno, and the curator with the ability to be everywhere at once who is head of the Serpentine Gallery, Hans Ulrich Obrist. 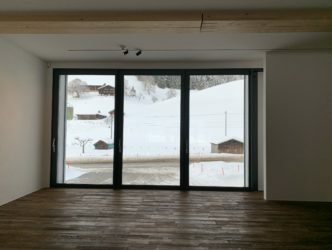 The Swiss Hauser & Wirth gallery is occupying the “Vieux Chalet” which once belonged to Brigitte Bardot’s former husband – now deceased – the art collector Gunter Sachs, where you can admire on appointment pieces by Calder and Picasso, among others. 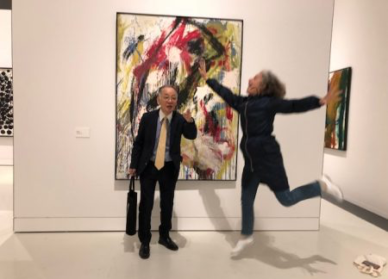 n the same town, Patricia Low has a gallery space in the centre where she is currently exhibiting the veteran American Pop artist Alex Katz.